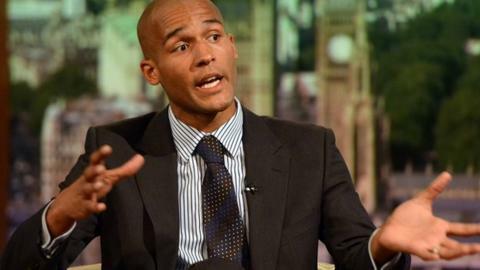 Former footballer Clarke Carlisle has confirmed he was not left in a coma following a suicide attempt. Carlisle, 35, suffered cuts, bruises, internal bleeding, a broken rib and a shattered left knee after being hit by a lorry on the A64 near York on 22 December. It came two days after he had been charged with a drink-driving offence of failing to provide a sample. A legal representative later told a court that Carlisle "was in a coma". Ex-Professional Footballers' Association chairman Carlisle left hospital on 30 January. But on 20 January his barrister, Zeenat Islam, told Highbury Magistrates' Court: "He was in a coma as a result of his injuries. He has only recently awoken from that coma in the last few days. "As it stands, he is not in a position to obviously attend court. We are unable to take instructions in relation to this matter." Deputy District Judge Peter King extended bail to 23 March. Carlisle this week told The Sun newspaper he had been left severely depressed by the end of his football career, financial problems and the loss of a television punditry role, leading him to make the attempt on his own life. He spoke of how he was moved from Leeds General Infirmary to a psychiatric unit in Harrogate, where he was placed on suicide watch on Christmas Day. He has since confirmed to the BBC he was never in a coma. The BBC understands the barrister wrote to the court and this mistake has now been corrected.